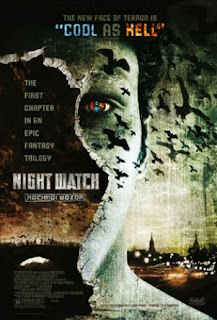 Night Watch, released in Russia in late 2004, is an intentional attempt to copy the sci-fi punk fantasy formula that has found a solid niche in the United States in the last several years. Of course, this genre hasn't exactly produced the highest level of quality to begin with. For every Dark City or Matrix, there's an Underworld or Ultra-Violet, or Aeon Flux, or Matrix Revolutions, or Blade Trinity. Why a foreign nation would want to emulate this not often worthwhile genre of American film making is a good and valid question. For whatever reason, Russian audiences have flocked to this would-be epic and its just-released sequel (Day Watch) and a trilogy caper is imminent. The original broke Russian box-office records, grossing over $16 million and the sequel has so far grossed $33 million (that's 432 million rubles and 891 million rubles respectively). This only proves that the current state of Russia is far more dire than we know. They have the crippling breadlines, the insane Russia/Chechnya territorial civil war (say what you will about George W., but at least he doesn't stage or instigate Al Qaeda attacks to give an excuse to arrest or trample political opponents and business rivals), and the government that is slowly slipping back into dictatorship (which tends to happen when you elect a guy with a mysterious past who probably worked for Blofeld and tried to kill James Bond back in the 1970s). So desperate is their situation that they have flocked to Night Watch, a film that is so awesomely bad that it may in fact be the worst thing to happen to Russia since the North Ossetia school massacre in September 2004. The plot, to wit: Thousands of years ago... superstition and the sword ruled. It was a time of darkness, it was a world of fear. It was the age of... Gargoyles? No, that would have meant being entertained. Instead this age of darkness/fear/swords involves two warring cultures with special powers, creatively named the Light and the Dark. Way back when, they stopped their fighting ways and made an uneasy truce. From then on in, the Light would watch the Dark at night, while the Dark would watch the Light during the day. Thus the truce has been kept, right under the noses of regular folk. Until something occurs to potentially break the truce. This thing doesn't actually occur until the last five minutes of the movie, as this is all set-up for the next two pictures. And what a ridiculous, boring, and sophomoric set-up it is. The Light and the Dark are together called The Others (insert your own joke concerning hatches, lottery numbers, or polar bears). In the present day, they have special powers; powers that aren't terribly well defined but they do involve jumping, kicking, making CGI light shows, and wearing sun glasses at night (the latter power apparently allows them to see the light that`s right before their eyes). The Dark are also vampires, and it's implied that the Light likes blood too, but who cares? The entire film is a mishmash of the worst of sci-fi. The characters are boring and underdeveloped. The action is fractured, heavily edited, and impossible to follow or care about. Even the audio is pointlessly loud. Worst of all is the story itself. Aside from the opening narrated prologue and several key events throughout the story, the picture is, from moment to moment, completely incomprehensible. The film is obsessed with being cool, hip, edgy, and geeky. Everyone is dressed in leather and everyone wears sunglasses. The music is loud and not the least bit lyrical. There is no poetry, only noise and random movement. In conclusion, Night Watch is downright unwatchable. It's the worst film so far this year and will probably keep that title for the near future. If this is the path of this particular trilogy, then perhaps the concluding saga should be entitled 'Don't Watch'.